Do we laugh through tears or do we cry through laughter? The answer to this question or perhaps the question itself are, for Irving Howe, the crux of Jewish identity. For Howe, the few Jews who really “scrutinize” themselves, the Jews who “dare to know” (so to speak), will come to this very question. Howe has taken this risk and his experience of this question concerning Jewish humor serves as an example of his Jewishness. This performance of Jewish identity – which comes out through his question concerning Jewish humor – is what Howe is showing us. Howe is demonstrating a Jewishness that is based on pondering the question of what Jewish humor and with it Jewish identity is. Either one laughs in order to dispel one’s sadness or one laughs and inevitably runs into sadness. For Howe, laughter cannot dispel tears. This declaration is, to be sure, Howe’s conversion experience. And he didn’t learn it from Saul Bellow, as he stated in his introduction to Jewish American Stories; rather, he learned it from an artist who is Saul Bellow’s Moses: Sholem Aleichem. The relation of Bellow to Sholem Aleichem is a missing link for understanding not just Howe’s approach to Judaism, which ponders the question as to whether one laughs through tears or cries through laughter, but Howe’s Judaism, which he inherits. Howe takes part in the legacy of a schlemiel tradition. He is, in a way, educating the next generation of (troubled) schlemiels. As I pointed out in the last blog-entry, Irving Howe, in his introduction to Jewish American Stories, and in this epistolary exchange, identifies with Saul Bellow’s reading of Jewishness. And, as I pointed out, Bellow’s reading of Jewish identity is made in terms of Jewish humor. Let us recall that Bellow finds that the uniqueness of Jewish humor is found in the fact that “laughter and trembling are so curiously intermingled that it is not so easy to determine the relation between the two.” Howe so deeply identifies with Bellow’s claim about the intermingling of laughter and trembling in the Jewish humor that he repeats it in his shared introduction to another book published. This new book, a collection of Sholem Aleichem’s stories, was published three years after Jewish American Stories. The 1979 collection of Shalom Aleichem stories is entitled The Best of Sholem Aleichem Stories. In that introduction, Howe once again nods to Bellow and notes that Jewish humor “laughter and trembling are so curiously intermingled that it is not easy to determine the relation between the two.” The fact that Howe repeats this definition – not simply of Jewish humor, but, for Howe, Jewishness- is significant: he shares this “declaration” of his Jewishness with Ruth Wisse, a scholar of the schlemiel. Given that he is testing his view of the schlemiel against hers, what Wisse says in response to Howe is even more telling. Her similarities with Howe are important, but her differences are more interesting. Her schlemiel and his differ. The difference between their views of Jewish humor is instructive for those of us, today, who are concerned with the meaning of Jewish identity. Their shared introduction to The Best Stories of Sholem Aleichem teaches us – by way of prompting us in a Talmudic manner – to interpret their relationship. To prompt their readers to make a more literary reading of their introduction to Aleichem, they structured it as an epistolary exchange. Let’s take note of this and read their dialogue closely. Ruth Wisse’s 1979 reading of Aleichem is of especial interest to a “schlemiel theorist” like me since Wisse is one of the foremost authorities on the schlemiel. Her reading of Aleichem and Howe’s reading are not simply founded on their similar yet different readings of Jewish humor but also their readings of Jeiwshness. For both, the famed Yiddish writer, Sholem Aleichem is an important starting point. As a historian of Jewish literature, Howe believes that without Sholem Aleichem their could be no be Saul Bellow. Bellow inherits crying through laughter not laughter through tears from Sholoem Aleichem. First of all, although the introduction begins with (and is initiated by) Howe’s reflections on Aleichem’s perplexing humor, it ends with Wisse’s resolution. Her resoluation balances between Howe’s “quizzical” view of Aleichem’s humor and Wisse’s own “quizzical” yet joyful view of his humor. In the end, it is not just a matter of emphasis; in fact, their views of humor also articulate two kinds of Jewishness. And the differences between these articulations are instructive and far reaching. For Howe, this view, which I will call the “kitschy” view, is wrong. The view of Aleichem (and the schlemiel) as simply a popular fun loving artist is, for Howe, too kitschy; and, as a result, it forgets history and rupture. To be sure, Howe doesn’t desire a kitschy kind of laughter through tears. 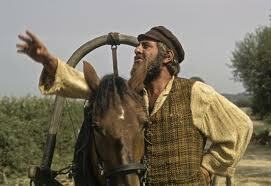 He’s not interested in a Broadway or a Hollywood Production of Fiddler on the Roof (1964). Howe wants to show us (demonstrate for us) that his commitment to troubled laughter, in the face of such nihilation, is based on the approach to Judaism of his progenitor, Sholem Aleichem. In other words, Howe’s Jewishness can be found in the troubled laughter we hear in Aleichem’s books. He wants to share this insight and demonstrate how a commitment to Jewishness must challenge the popular, kischy view, that laughs through tears. Howe seeks to set the record straight. In the introduction he shares with Ruth Wisse, Howe tells us that Aleichem, like Bellow after him insist that to be Jewish we must admit that we cry through laughter. This is tantamount to, as Howe says, “declaring” one’s Jewishness. Wisse responds to Howe’s declaration with her own.